For centuries, people cooked their food in pots and pans coated in lard, oils or some type of grease to keep the ingredients from sticking to the cookware. While keeping the food from clinging to the sides of their utensils, the added lubricants were not exactly heart-healthy. Then came Teflon and other nonstick cookware, which eliminated the need to add oils. But with the convenience has come various health and safety concerns about what we are ingesting along with the cooked food. In 1938, a DuPont Co. chemist discovered a waxy substance that turned out to be the most slippery in the world. Called polytetrafluorethylene, or PTFE, DuPont trademarked the substance as Teflon. It was not until 1954 that a French inventor discovered how to bond Teflon to frying pans. The company Tefal, which morphed into the mega-manufacturer of cookware, T-Fal, was created. The early pans, however, performed poorly. Their surfaces often began flaking within months. It really was not until the late 1980s that DuPont and others were able make additives such as ceramic and stainless-steel powders that bonded with the coatings, resulting in more durable cookware. 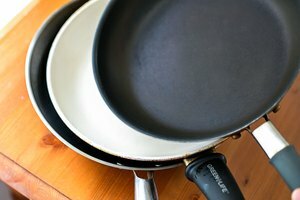 Most observers believe the health problem with nonstick cookware occurs if the pan is heated too high. DuPont advises that its Teflon coating can withstand a maximum temperature of 500 degrees Fahrenheit and recommends not exceeding that hot point. Heating the pan above this temperature can result in "outgassing," which means possibly toxic fumes are released into the surroundings. This can be particularly hazardous if the cooking area is not well-ventilated. If a cook has a pet bird, she should avoid using Teflon. This is because the respiratory systems of birds are extremely sensitive to the fumes emanating from Teflon-coated cookware. In a condition called "Teflon Toxicosis," birds can literally suffocate when the fumes enter the lungs, which leads to hemorrhaging. Many nonstick manufacturers include warnings of this hazard with their cookware. Some researchers also have found that humans might also suffer from inhaling the fumes resulting in a condition called "polymer fume fever." This induces temporary flu-like symptoms. 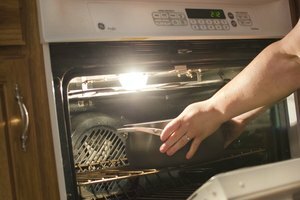 To improve nonstick cooking safety, consumers should always replace their pots and pans at the first sign of chipping, flaking or any other type of wear. Never use Teflon or other nonstick cookware under a broiler or at high stove-top heat. Other tips include: Do not use metal utensils on nonstick surfaces; wash the cookware by hand using nonabrasive cleaners, never steel wool; and do not stack the cookware as that can easily lead to scratches and chipping. There are a number of alternatives to cooking with nonstick cookware. The convenience of not having to add oils or butter to the pot or pan is lost, but the potential dangers are also eliminated. 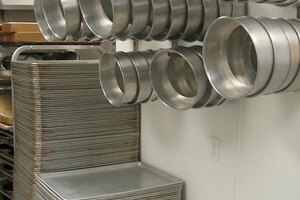 Some types of cookware that might be considered in place of nonstick include anodized aluminum, which does not react with ingredients; enameled or regular cast iron; glass and stainless steel. Should You Buy Nonstick Cookware? What Are the Dangers of Calphalon Cookware?